The past few days have been a trying time in Metsland. After Monday’s heartbreaker in which the team blew a 6-1 lead in the eighth inning, followed by Tuesday’s frustrating loss, it was looking like the early-season mirage was over. The Mets were still the same old losers, and the Nationals still owned them. It was back to life, back to reality. Back from a fantasy and back to (eventually) second place. And the first seven innings of last night’s game did nothing but reinforce those fears even further. Right out of the gate, the Mets were playing from behind. A three-run homer from Ryan Zimmerman in the first inning off Steven Matz got the Nats started. And that first inning was a particularly rough one for Matz, who threw more than 30 pitches in that frame alone. He allowed another hit in the inning but settled down after that, retiring the next 11 hitters he faced. The Mets clawed back with two runs of their own in the fourth on an Adrian Gonzalez RBI single and a Zimmerman error that resulted in a run, but the headline of the inning was that Mickey Callaway curiously pinch hit for Matz — who had only thrown 74 pitches and was cruising — with only one out and two on. Brandon Nimmo was the pinch hitter and got hit by a pitch to load the bases (and adorably ran to first base in the process). Amed Rosario then came up with the bases loaded and only one out, only to ground into an inning-ending double play. The Mets still trailed. It was merely another tease. New York’s bats would basically go dormant from there, because of course they did. Paul Sewald took over on the mound after that, and kept Washington close. He delivered a perfect fifth and sixth inning, and his only real blemish in the seventh was a Ryan Zimmerman triple; it was just a poke job to right field that Jay Bruce irresponsibly dove for and missed as the ball went behind him. Moises Sierra would hit a sacrifice fly, but Sewald got through the next two hitters without a problem. He’s now struck out 12 batters and has allowed only four hits in 8.1 innings of work this year. He probably deserves a larger role in the bullpen going forward. Is that a nine? That looks like a nine. Down two, the Mets put up a nine-spot. It was the team’s biggest inning since April 2016. Two days after their own bullpen got knocked around and blew a five-run lead, the Mets returned the favor and did a number on the Nationals’ bullpen. Specifically, that number was a nine. Climb that ladder, Yo! 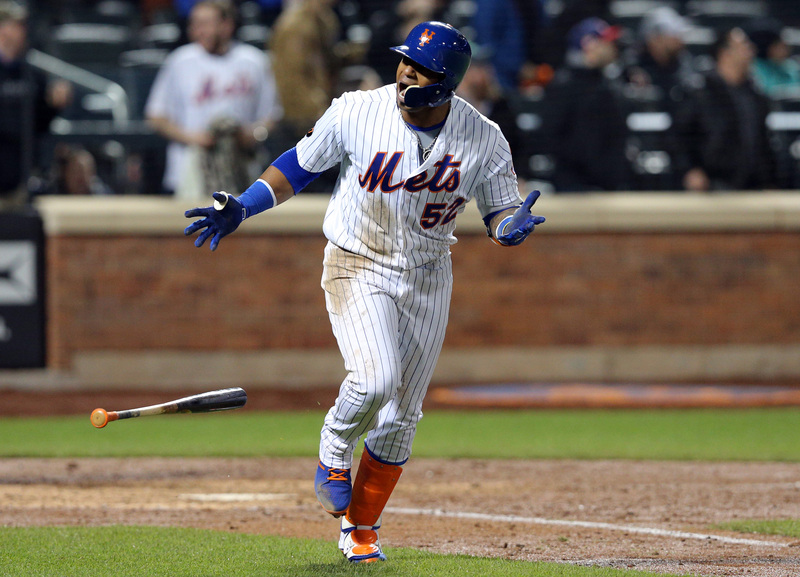 @ynscspds crushed a grand slam for the @Mets on a pitch that was 3.82 feet high. My god, man. Almost four feet off the ground. Yoenis Cespedes really seems to have a knack for looking terrible for certain a period of time, and then out of nowhere just crushing a ball that he has no business even making contact with. One of these days, he’s going to enter a game in an 0-for-18 slump and then hit a pitch that’s behind him for a 450-foot home run. The Mets won the game, 11-5. Ryan Zimmerman hit another homer in the ninth off Seth Lugo, but I don’t think anyone noticed. DOES JOSE REYES HAVE A HIT YET? The Mets have signed pitchers Vance Worley and Scott Copeland to minor league contracts, and released A.J. Griffin, who had allowed 16 runs in three innings for Triple-A. Is that good? The Mets go to Not-Turner Field (SunTrust Park) in Atlanta to take on the Braves in a four-game tilt starting tonight. Matt Harvey takes the mound for the Mets against an unannounced starter for the Braves at 7:35 p.m.
How long can the Mets justify carrying Jose Reyes?